DENTAL HEALTH IN ASTHMATICS TREATED WITH INHALED CORTICOSTEROIDS AND LONG-ACTING SYMPATHICOMIMETICS. There is no enough evidence in literature for the effect of inhaled corticosteroids and long-acting sympathicomimetics on dental health in asthmatics. The aim of the study is to follow up the changes in dental plaque pH and dental health in asthmatics with mild persistent asthma, treated with different combinations of inhaled corticosteroids and long-acting sympathicomimetics. Seventy patients of both sexes, from 20 to 55 years old participated in the study. 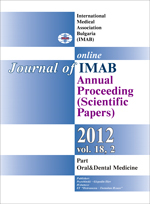 Changes in plaque pH and dental status are evaluated in two visits, in six months interval. There are no significant differences between asthmatics and controls when plaque pH values are compared. Substantially lower pH values are determined for maxillary teeth in both groups. DMFT index is significantly higher in asthmatics than in the controls. It increases substantially at their second visit. Significantly higher mean levels of DMFT index for each jaw are found out in asthmatic group. Key words: asthma, inhaled corticosteroids, inhaled long-acting sympathicomimetics, plaque pH, dental health.